MOSCOW, December 5. /TASS/. 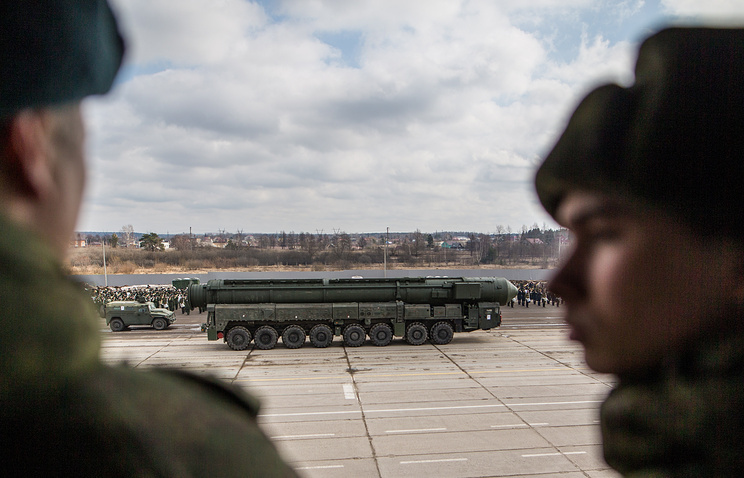 Russia is boosting the capabilities of its nuclear forces while the United States is building up its missile shield, Chief of Russia’s General Staff Valery Gerasimov said at a news briefing for foreign military attaches on Wednesday. "As the US was building up its global missile shield, Russia was increasing the combat potential of its ground-based strategic nuclear forces," the general said. In particular, Russia’s Strategic Missile Force is being rearmed with Yars missile systems and the Avangard missile complex equipped with the hypersonic glide vehicle has gone into serial production, the Russian general said. Russia is developing the Sarmat heavy intercontinental ballistic missile system to replace its most powerful Voyevoda ICBM. In 2018, the Sarmat successfully passed pop-up tests, he added. Russian strategic submarines are on constant combat duty, carrying out their patrols, including under the Arctic ice, the general said. Gerasimov stressed that the United States has the ability in the shortest possible time to increase its nuclear strike potential by more than 1,200 nuclear charges. "Unfortunately, our American partners in order to reach quantitative parameters of the New START, have been re-equipping a part of their strategic offensive devices for 2 years (four launchers on each of the 14 Ohio-class submarines 41 B-52H tactical bombers) and unilaterally excluded them from the Treaty’s record. This gives then the opportunity to build up the potential of their strategic offensive forces in the shortest time possible and to increase the number of warheads by more than 1,200 units," Gerasimov said. "The sea-based strategic nuclear forces will be developed further through the construction of Borei-A submarines carrying ballistic missiles with the means of overcoming the missile shield," he noted. The potential of the airborne strategic nuclear forces is maintained through the modernization of strategic Tupolev Tu-160 and Tu-95MS missile-carrying bombers. Russia is furnishing these planes with more powerful engines, modern onboard equipment, and is also expanding the range of their armament, the general said. Russia is also building up its space-and ground-based echelons of the missile early warning system, Gerasimov said. Russia has also completed creating the continuous radar field along its borders, the general noted. "This has guaranteed detecting ballistic missiles from all missile-dangerous directions and by any type of their flight trajectory," Gerasimov said.